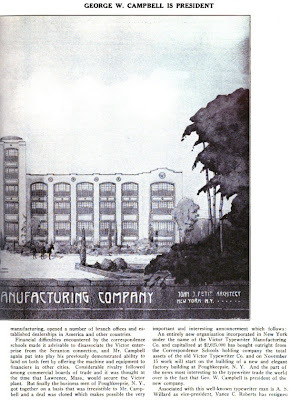 the fifth year of production. 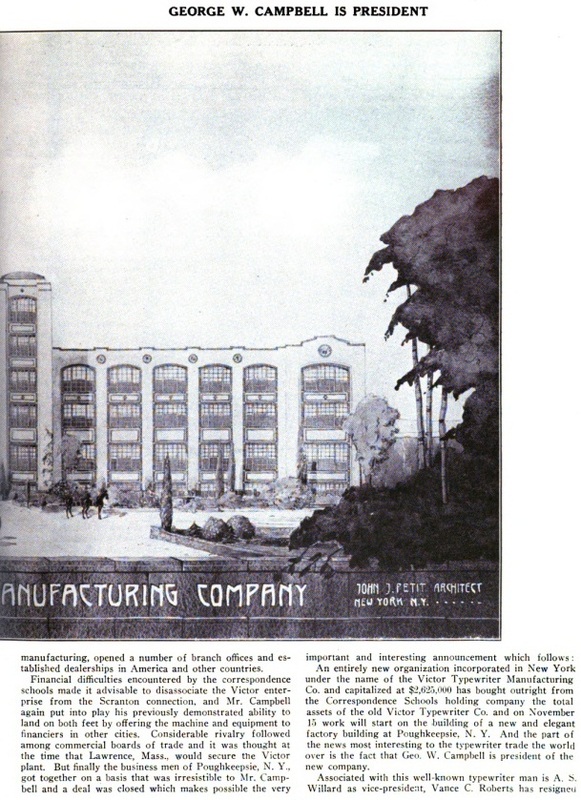 It was designed in 1918 by George William Campbell. 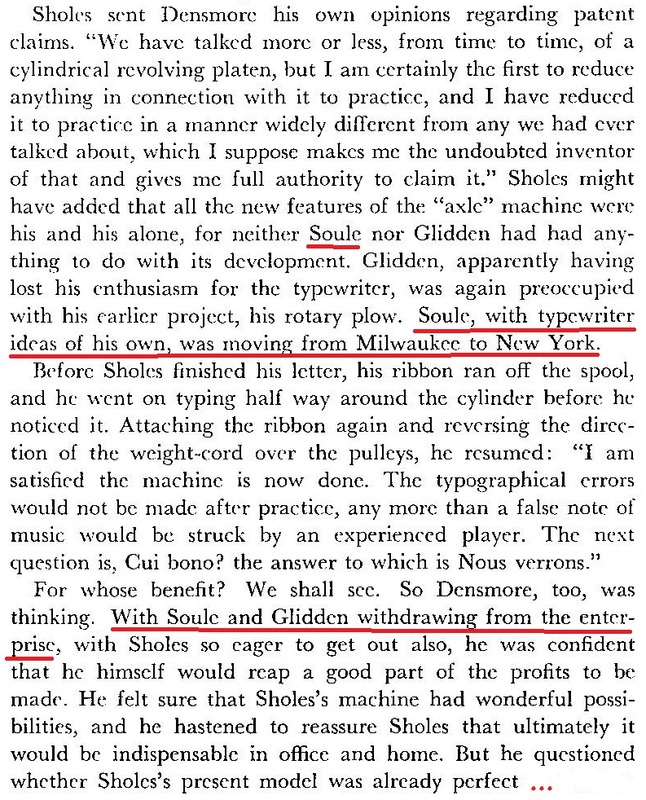 It's amazing how much one can find out about the history of a series of typewriters by simply digging under the career path of one man. 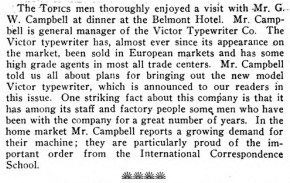 That one man is GEORGE WILLIAM CAMPBELL, born to Scottish migrant parents in New York City on May 23, 1872. 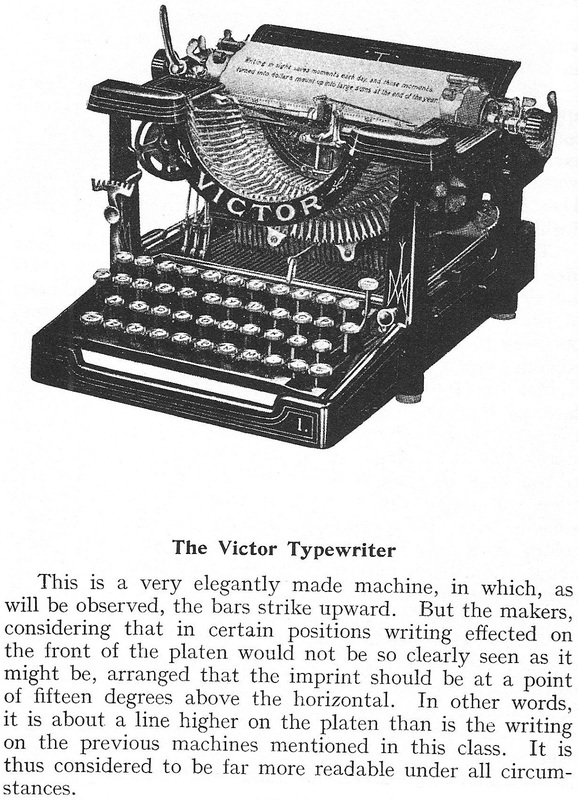 Campbell is the typewriter mechanical engineer and designer responsible for at least three machines which are among most collectors' favourites: the Franklin No 9 (with the concealed ribbon spools), the Victor No 1, which of course in time (12 years) grew into the Victor No 10 (the only Victor which Campbell had nothing to do with), and the first Underwood four-bank portable typewriter. 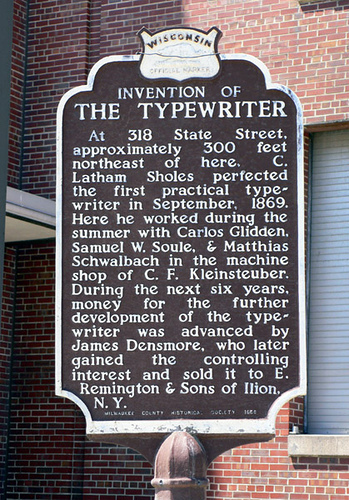 In retracing Campbell's steps during a truly remarkable 50-year career in the US typewriter industry, which took him from Boston back to his native New York and on to Hartford, Connecticut, I was able to finally deshroud the obscurity surrounding the Victor's origins - not to mention its fate. 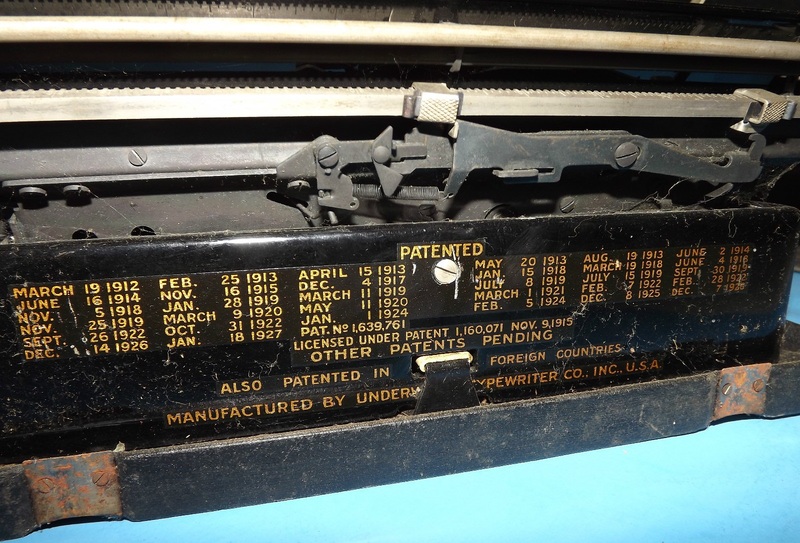 It all started with the appearance on US eBay last night of an Underwood four-bank portable with a decal on the back which showed all of the 32 patent dates associated with the 14-year component development (1912-1926) of this wonderful machine. 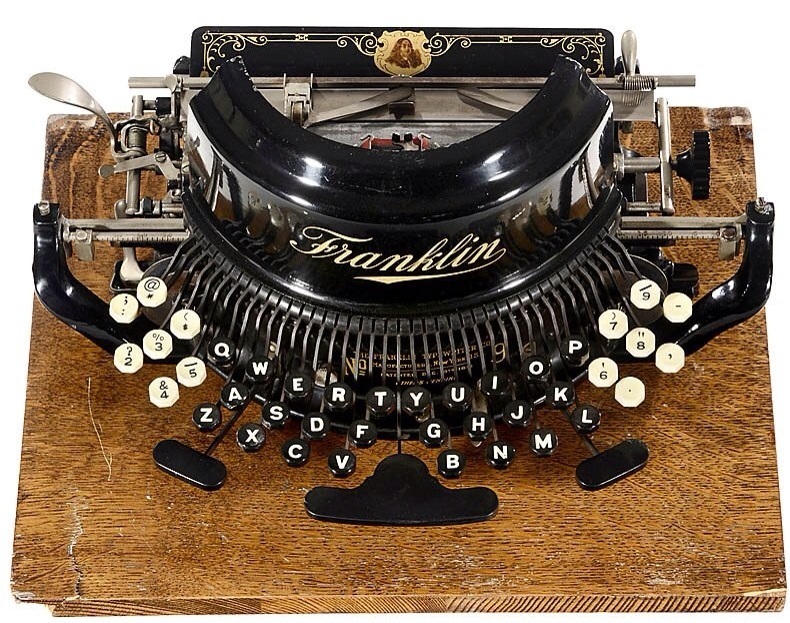 As I checked through these, I found that Campbell had in fact come up with the original design for this almost flawless typewriter. 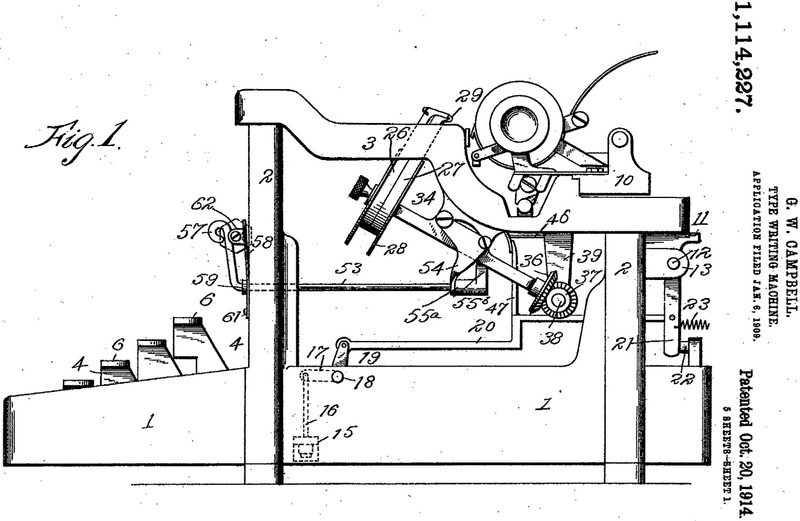 When I started looking into Campbell's typewriter-designing career, my eyes were really opened up - I found 25 typewriter inventions patented by him, as against just the one in the patent database. I had previously been aware of his existence, and of his work for Victor and Underwood, but had no idea of how significant or extensive it was. 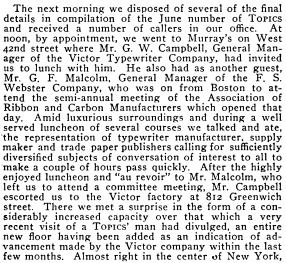 More importantly, I didn't realise he had worked for Franklin in Boston before returning to New York City in 1907. 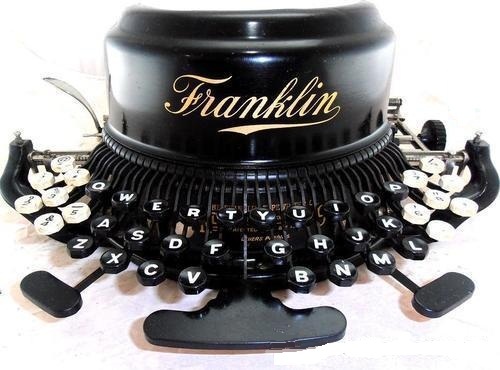 He provides a vital connection in our understanding of how Franklin transmogrified into Victor. Typewriter Topics' 1923 A Condensed History of the Writing Machine had been far, far too oblique on this subject, reporting details as if stepping on egg shells. In 1918, Campbell had been working with Willie Dobson in making improvements to the Underwood three-bank portable, which Lee Spear Burridge had designed just before his death in 1915 and which did not go into production until 1919. 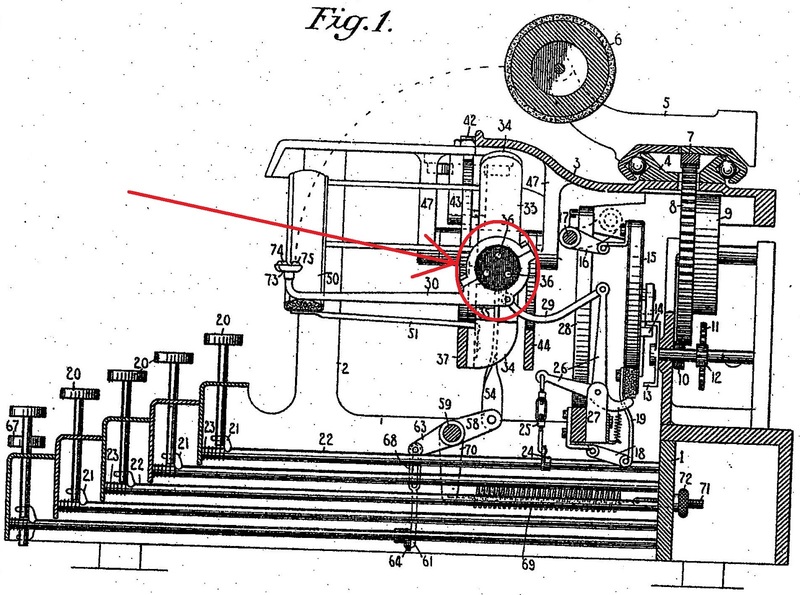 Essentially, Campbell and Dobson were making adjustments to Burridge's design, incorporating typewriter advances which had occurred between 1915 and 1919 - plus Campbell designed the Underwood 3's fantastic, compact little case. 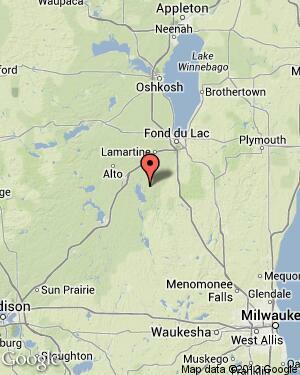 But I'm getting ahead of myself, in my excitement at discovering all of this. 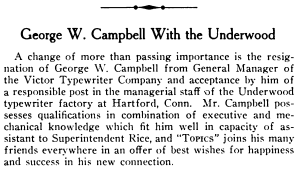 Campbell was a typewriter technician who started working for the Tilton Manufacturing Company making the Franklin in Boston in 1889. Wellington Parker Kidder's Franklin had languished for a few years, the last versions of it, the Nos 7 and 8, having come out in 1898. 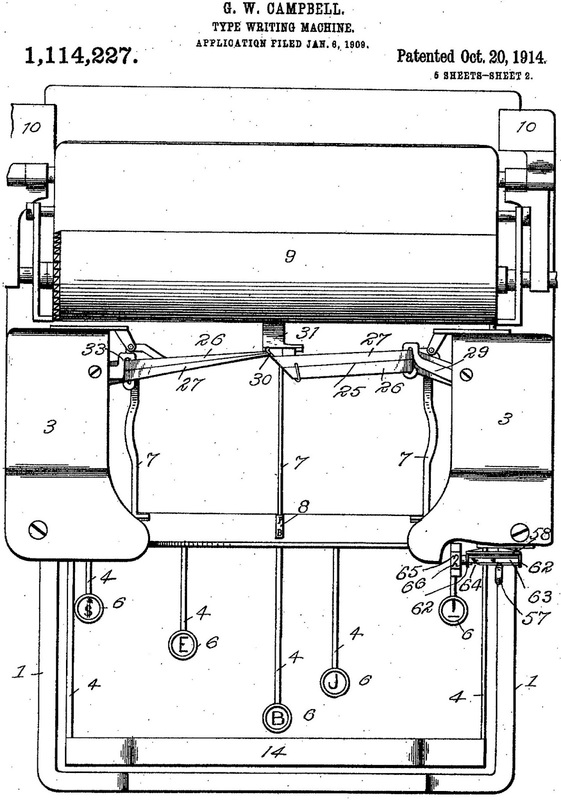 Campbell revamped the machine, notably taking the ribbon spools away from the back centre, above and behind the platen, to being concealed under the segment. 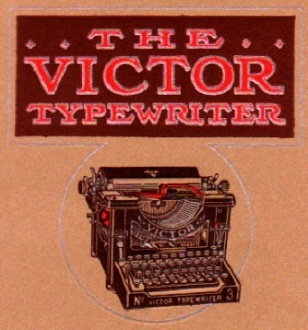 When Franklin turned into Victor and the works - including Campbell, as well as lock, stock and barrel - moved to New York, Campbell took over as general manager and designed the frontstrike Victor No 1. At this stage Victor, still owned by International Text Book (which in turn was owned by a holding company, the financially-troubled International Correspondence Schools) was moving to Poughkeepsie, New York, but obviously the deal floundered and in 1917 the factory moved to Scranton, Pennsylvania. 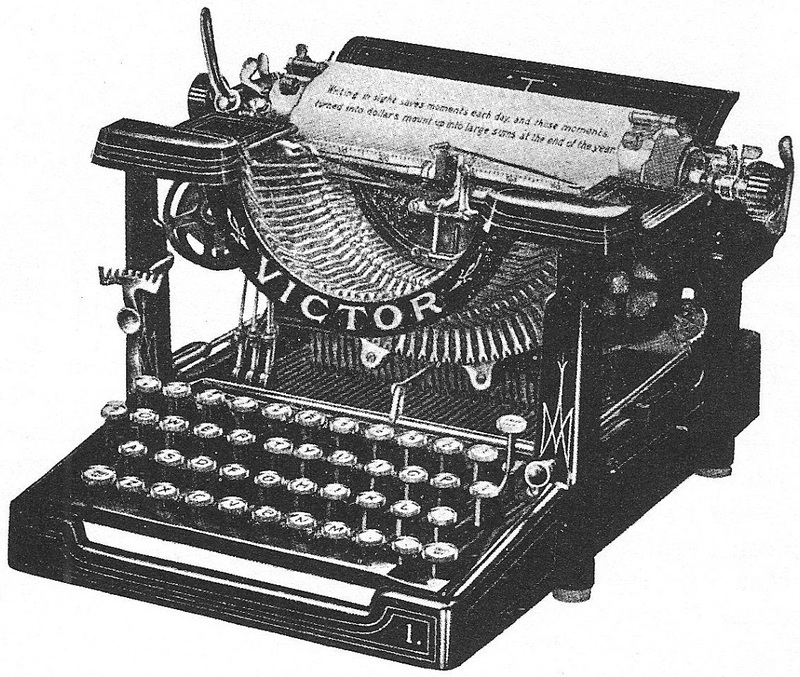 Technically, ICS had held the Victor assets, which Victor bought in 1915. In 1921 Victor and ICS became separate entities. 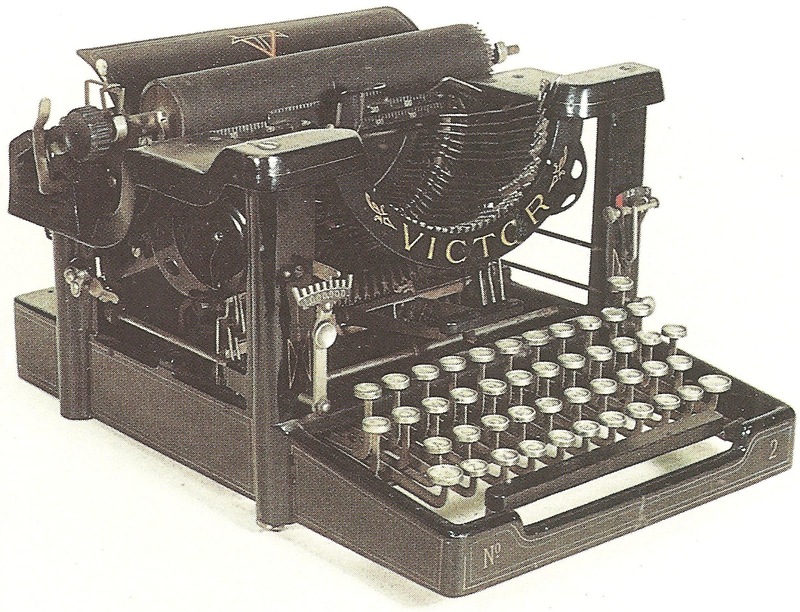 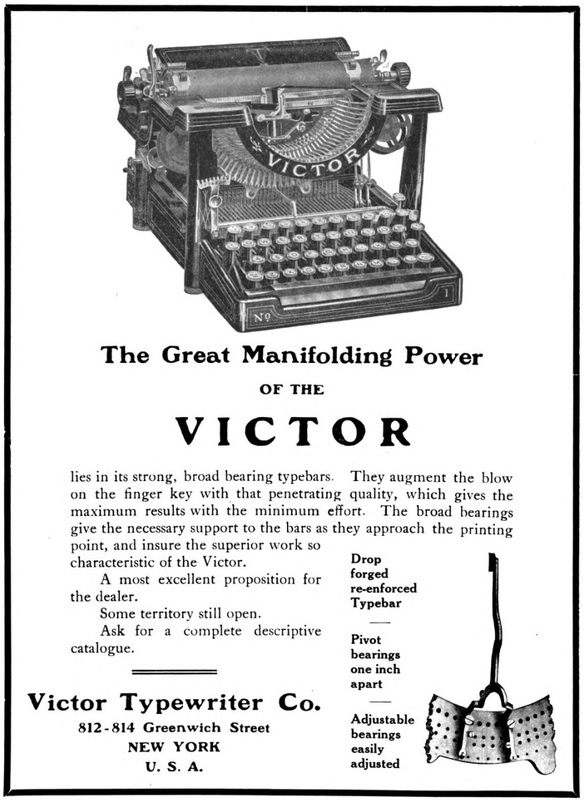 Victor was sold to the Victor Adding Machine Company in 1925. 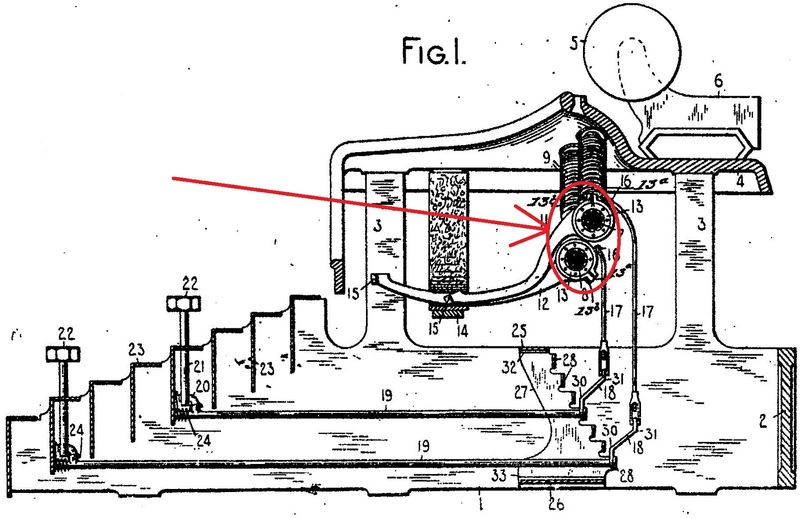 See my post on this here. 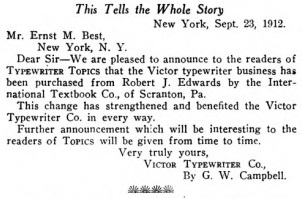 Campbell ran the show at Victor until after it was sold by Robert J.Edwards in September 1912 to the International Text Book Company of Scranton, Pennsylvania. 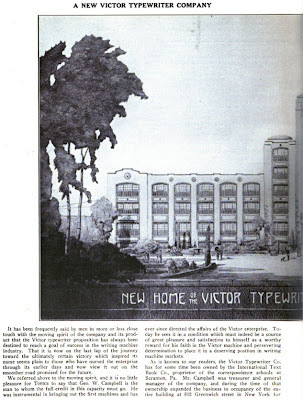 Victor eventually moved to Scranton in 19197, but without Campbell. 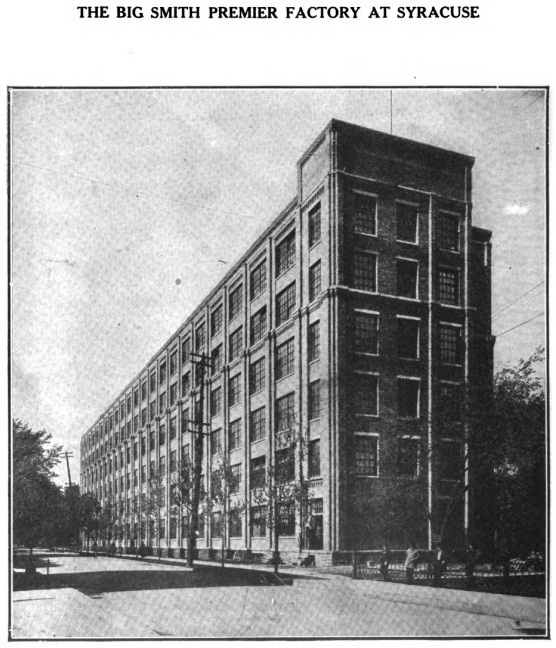 In November 1916, as Underwood began to rapidly expand at Hartford, including starting to look at producing its own portable, the company headhunted Campbell to leave Victor and move with his wife Lilla to Connecticut. 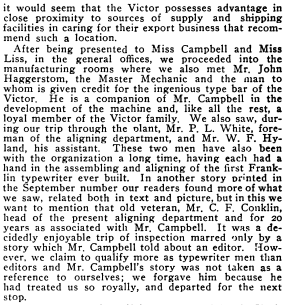 There the couple stayed until the mid-1930s, with Campbell remaining superintendent of the Underwood factory well into his 60s. 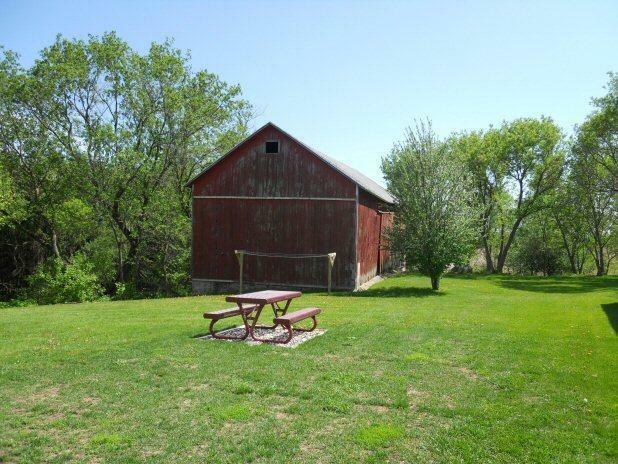 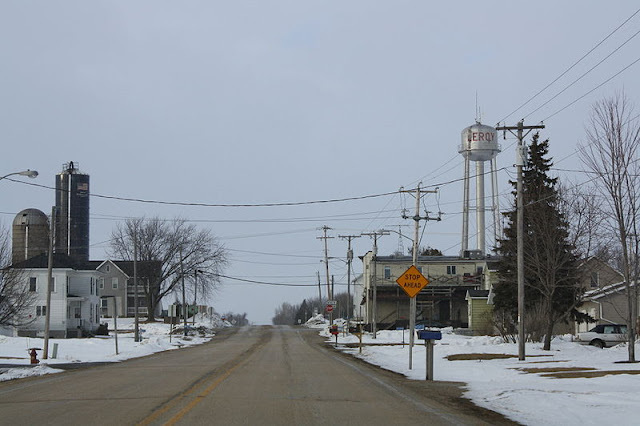 LeRoy, Dodge County, Wisconsin: Home of the Typewriter? 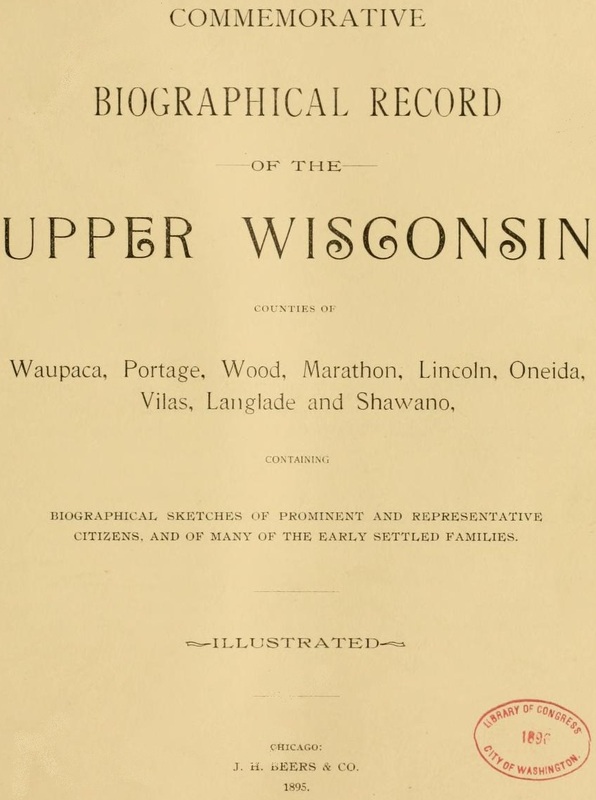 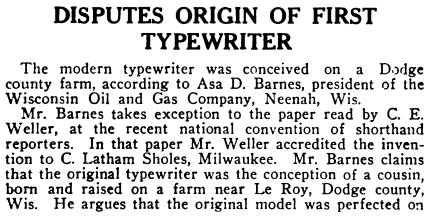 Was the typewriter born on a farm in LeRoy, Dodge County, Wisconsin - population 1121 (July 2009) - and not 48 miles north-west in Milwaukee? 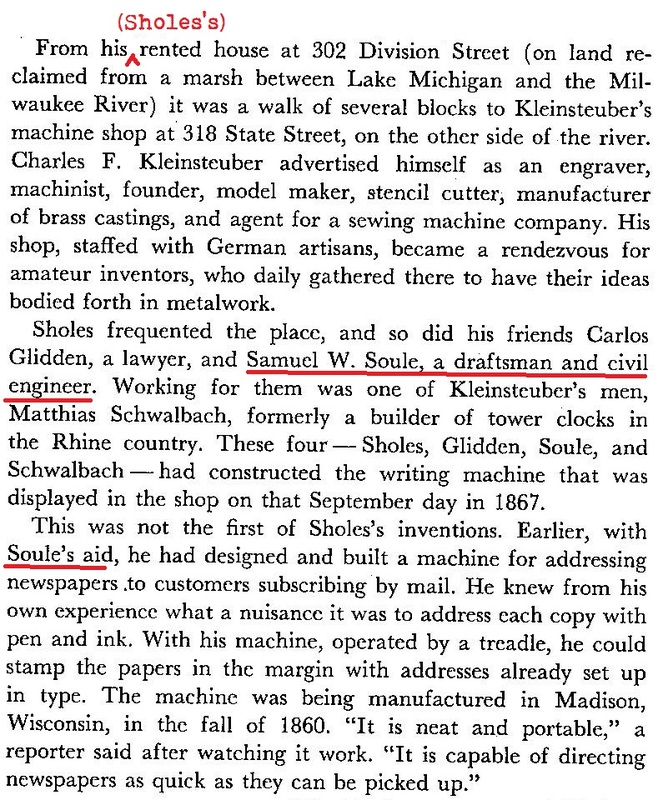 Samuel Willard Soulé was born in Pompey, Onondaga, New York, on January 25, 1830 to Elisha Soulé and Clarissa Higgins Willard. 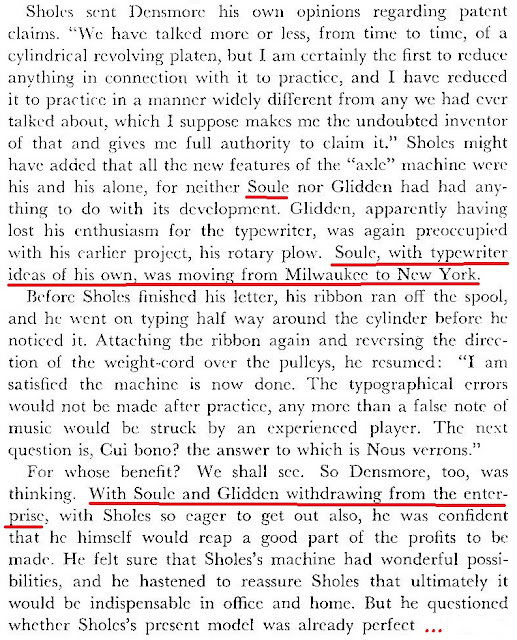 Soulé died on July 12, 1875, in Brooklyn, New York, just one year after the first Sholes & Glidden typewriters left the E.Remington & Sons factory in Ilion, New York. 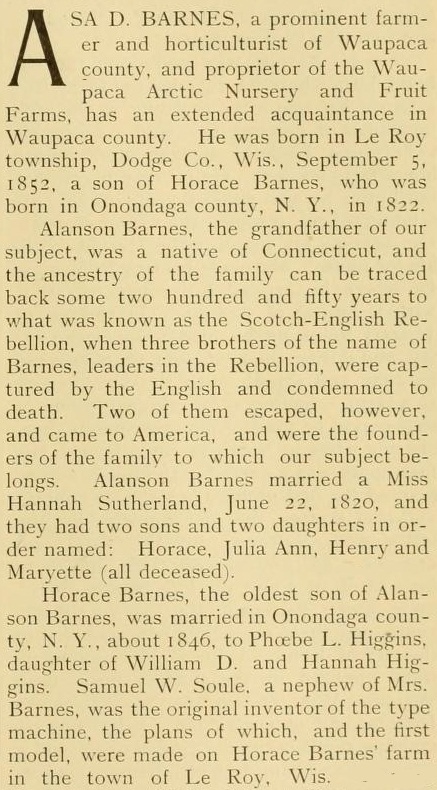 Horace Barnes, the oldest son of Alanson Barnes, was married in Onondaga County, New York [in] about 1846, to Phoebe L. Higgins, daughter of William D. and Hannah Higgins. 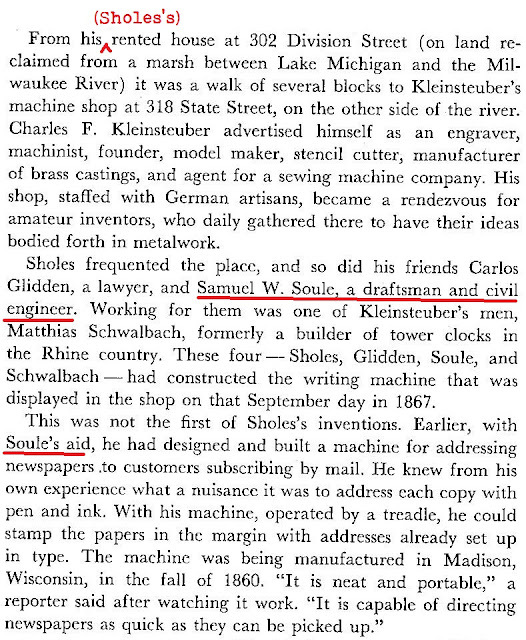 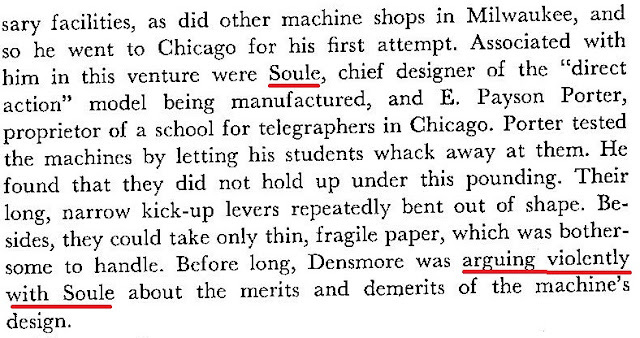 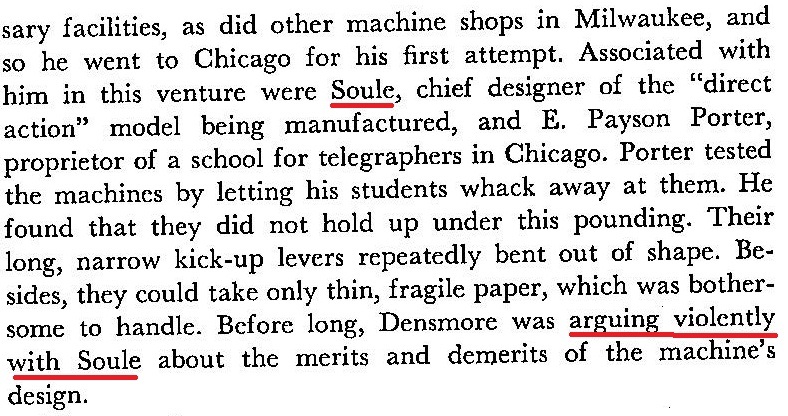 Samuel W. Soulé, a nephew of Mrs Barnes, was the original inventor of the type machine, the plans of which, and the first model, were made on Horace Barnes' farm in the town of Le Roy, Wisconsin." 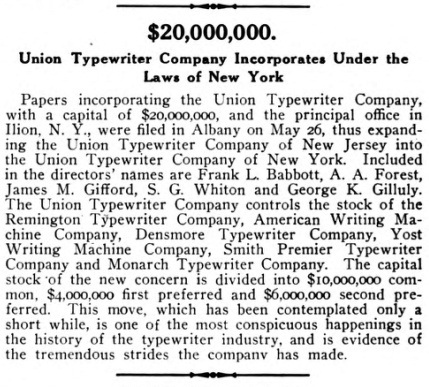 The Union Trust was formed in 1893 to resist the advance of visible writing typewriters, initially the Oliver and then the Wagner-Underwood. 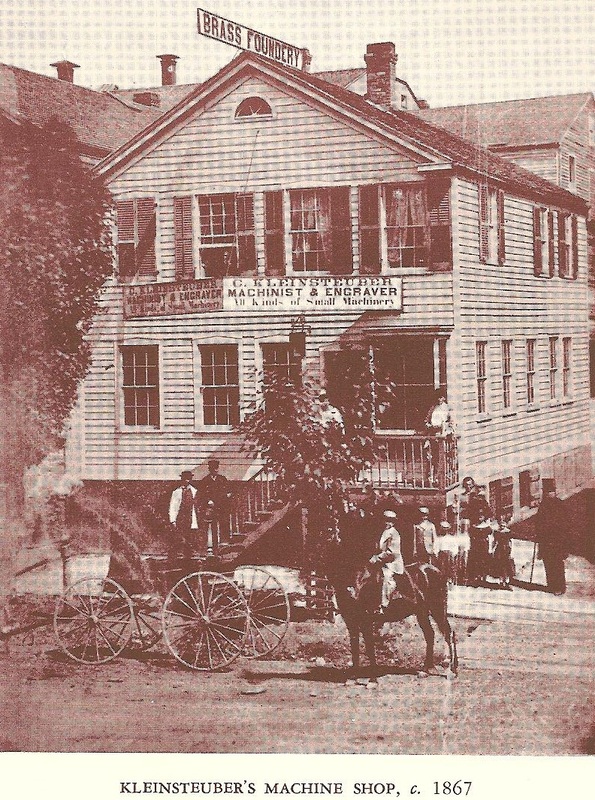 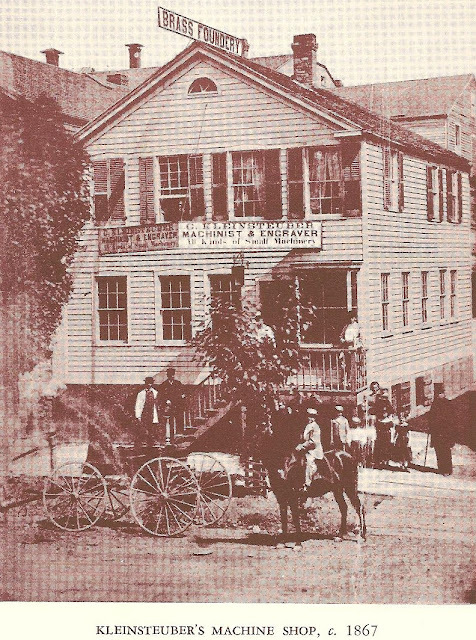 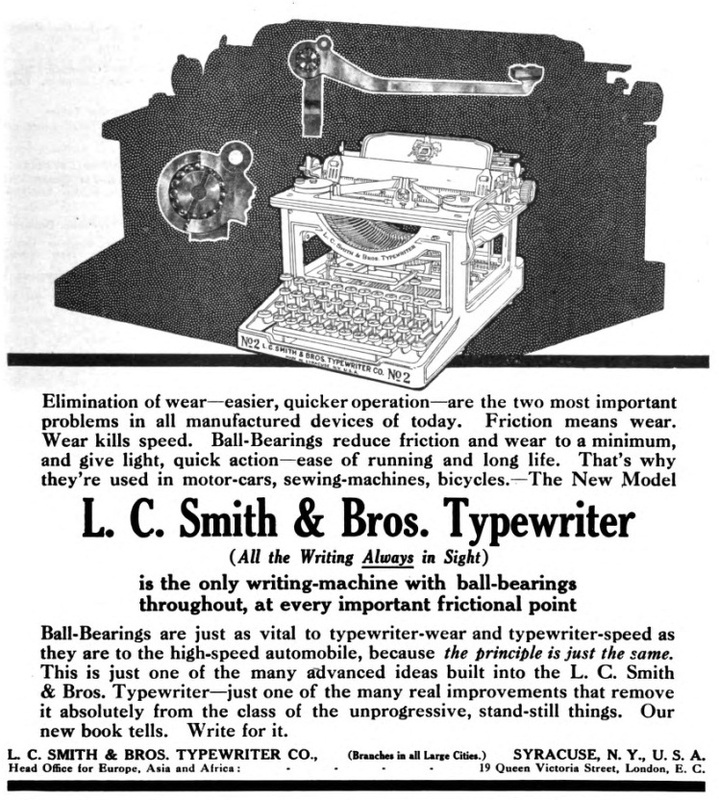 On January 27, 1903, the Smith brothers - Lyman C., Wilbert L., Monroe C., and Hurlbut W. - broke ranks, leaving the family's Smith Premier brand behind them to form L.C.Smith & Brothers. 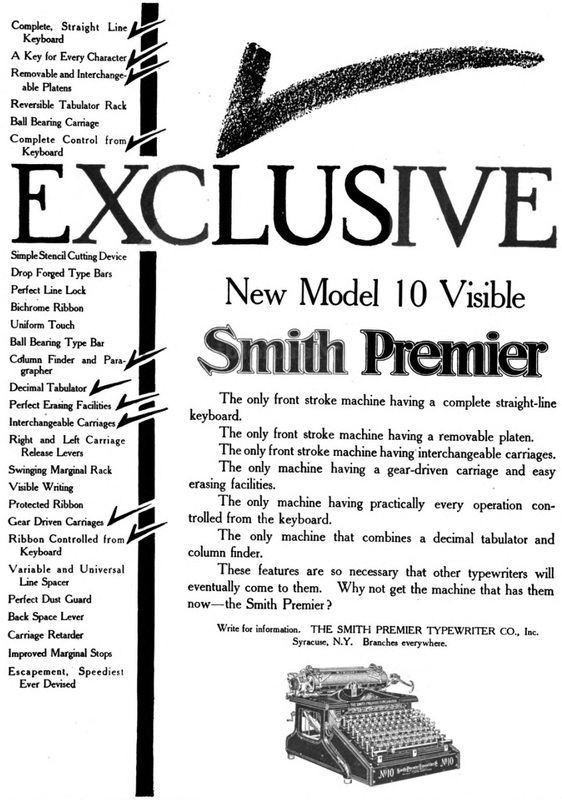 According to this company's history, "The Smiths ... were quick to realize the advantages of the 'writing in sight' principle, but they were unable to convince their associations in the Union [Trust] [that is, Remington, Monarch, Yost, Densmore, American Writing Machine]. 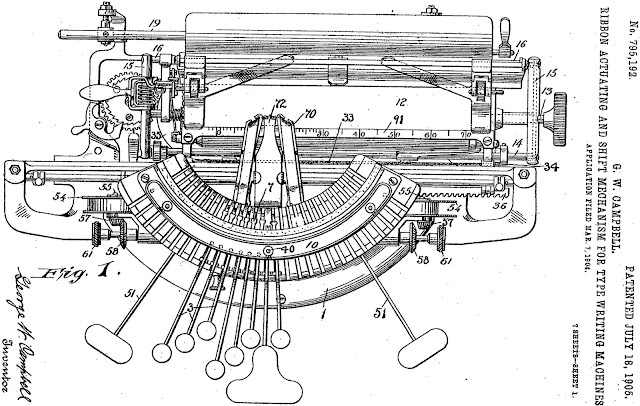 And so they decided to withdraw ... for the production of a 'visible' typewriter." 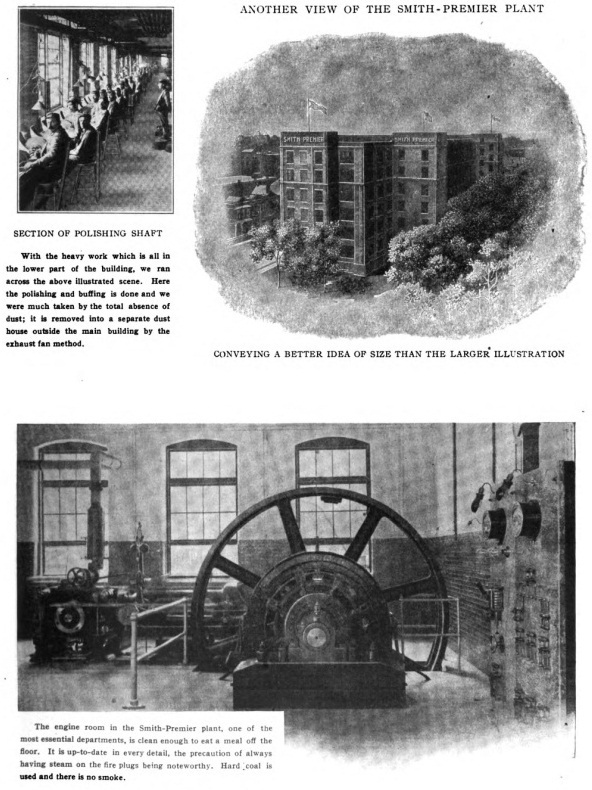 By the end of 1904, L.C.Smith & Brothers had launched just such a machine. 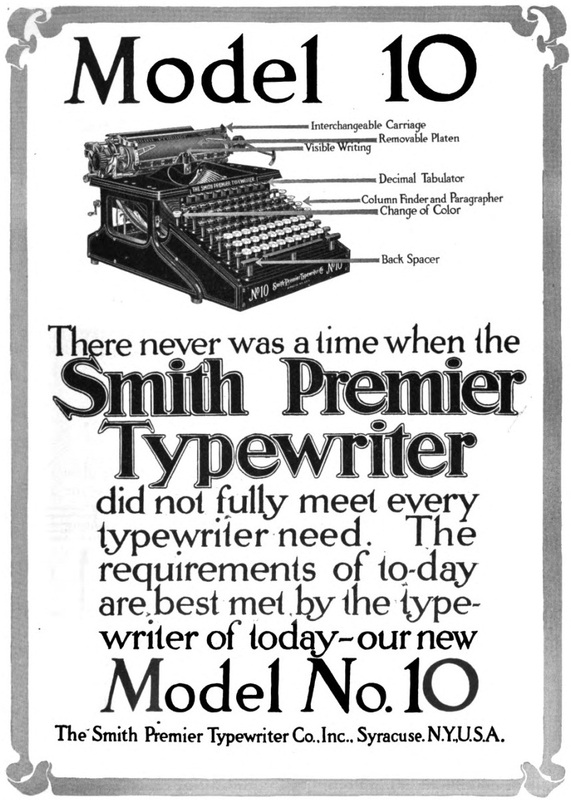 Even before the L.C.Smith & Brothers Model 1 appeared, Trust companies had been sufficiently jolted by the Smiths' resignation to start thinking about going down the inevitable path, and in terms of manufacturing their own visible typewriters. 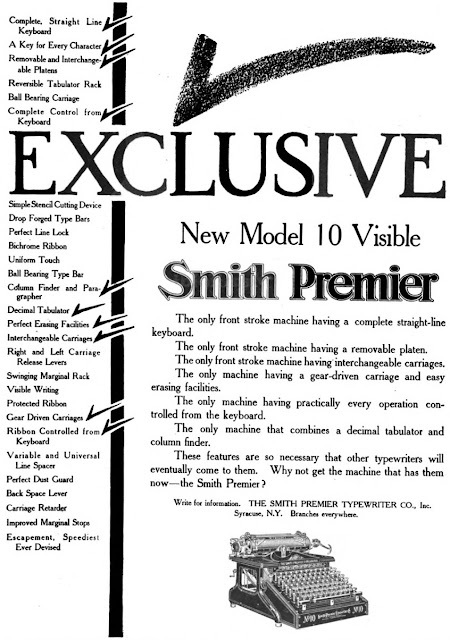 The Union's No 1 machine designer and mechanical engineer, John Henry Barr, began working on a frontstrike typewriter in June 1904, six months before the first L.C.Smith machine left that firm's new Syracuse factory. Although Remington, Smith Premier and Monarch were all to use Barr's visible typewriter patents in the following years, Trust companies did not act immediately. 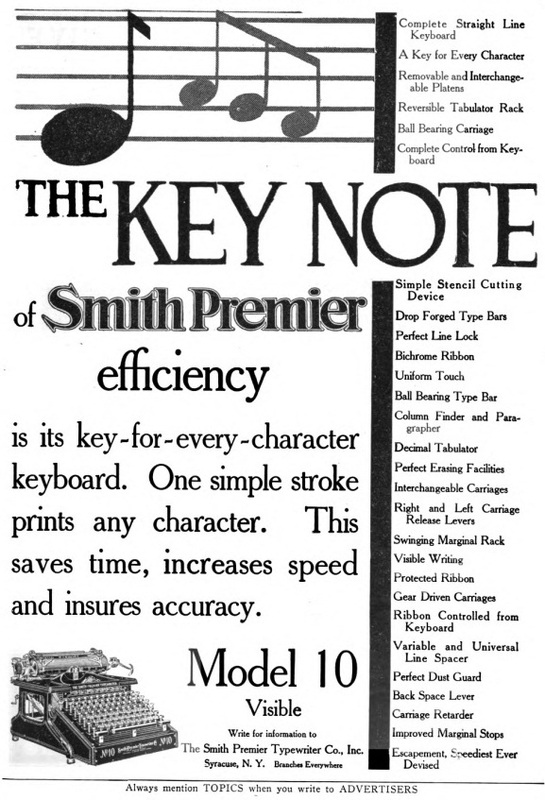 Remington brought out its first frontstrike machine in 1908 (its Model 10) and the Smith Premier No 10 came out a year later. 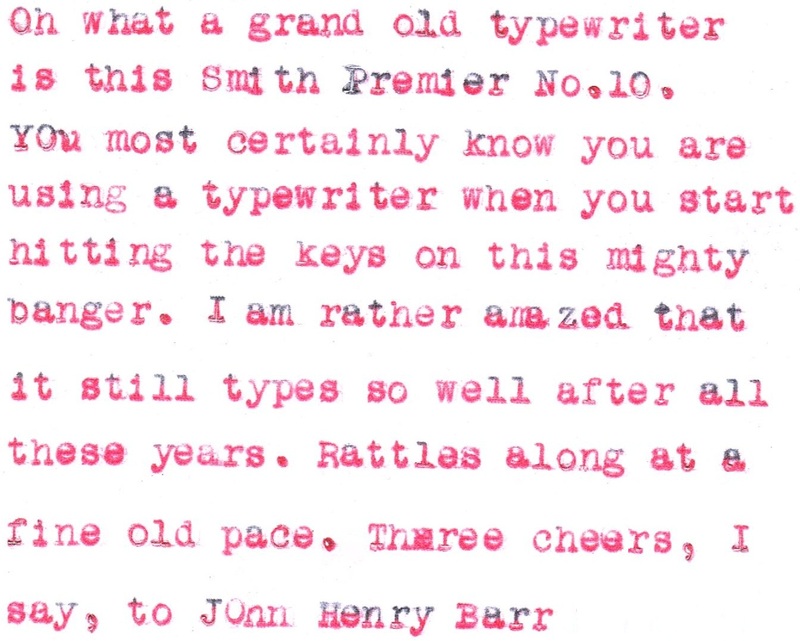 Barr was essentially working on converting the Alexander Timothy Brown-designed Smith Premier to a frontstrike machine, but concentrating on the typing action. 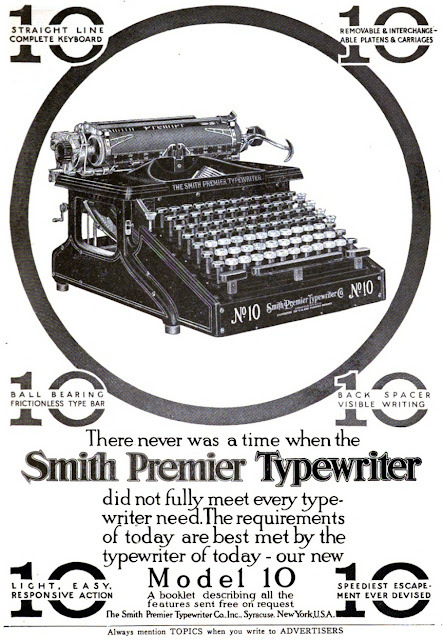 Here is Barr's 1904 design for Smith Premier, followed by a joint final design with Brown patented in 1908. 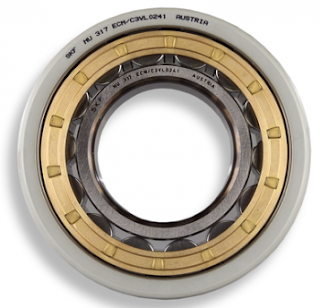 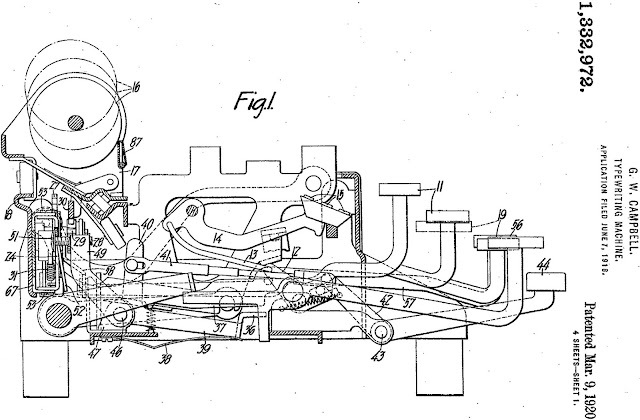 Barr insisted in 1904 that the machine itself was not his design, while he and Brown pointed out the ball-bearing typebar in the 1908 patent was all Barr's work. 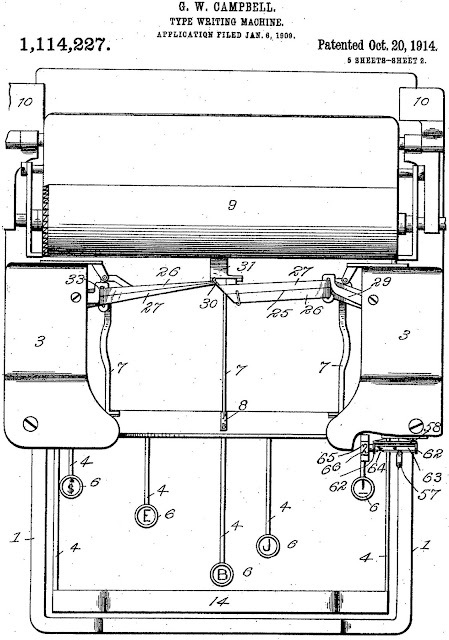 Note the curved typebar in the joint 1908 patent.